As mentioned previously, this last weekend I traveled with family to Idaho to conduct funeral services for my mother. It was an emotional weekend while we celebrated her life, sharing great memories. I tried to keep my camera unobtrusive, but as my family knows I like to document significant events like this, and always keep on the look out to get photos of family and friends. Just before leaving the cemetery I spotted my niece tracing the inscription of a nearby headstone with a feather she had found. I quickly snapped this shot of her. 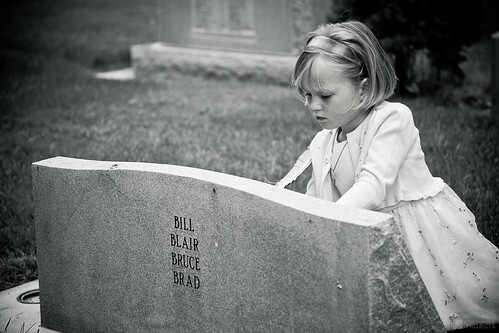 I thought she portrayed a little angle inscribing into the headstone. I am sure someone more creative (and with the time) could turn this into a more angelic scene, but I thought the foundation for it were well portrayed. This is a photo of my lovely bride holding her most recent nephew. Moments like this used to scare me because I knew another child was in our near future 😉 I kid, but my wife is the most loving natural mother I have ever known. She loves to hold babies and will be immediately drawn to care for a child. One of the many reasons I love her. This last weekend we traveled to Idaho Falls to have a funeral for my mom. It is always an emotional time to lose a family member, especially a parent. That said, we had a wonderful weekend visiting with family, which is something my mom always loved for us to do. She was buried in the Ammon, ID cemetery next to her parents. We took a few minutes to visit the Idaho Falls and of course snap a few photos. This is one of the “snapshot” photos I took. I always smile when I realize I am taking the typical touristy snapshot, yet we have to take them, right? I do try to wander around and find different ways to capture the same scene different than the next photographer, but I do try to get the”typical” shot as well. I’ve been neglecting blogging, posting and even photography for a bit. Frankly I was burnt out. That happens every so often though, and I find a little time off can be a good thing. I really am trying to work up the motivation to launch a more focused photography blog and likely shutter this one. I’ll keep up the old posts though either here or on the new site. On another note, my sister-in-law wrote up a nice tribute to my mom over on her site.